Zinc is an essential mineral that plays an important role in many enzymatic functions. Found primarily in the kidneys, liver, pancreas, retina and brain. 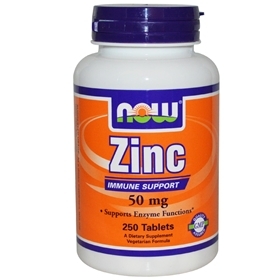 Zinc also helps support healthy immune system functions and is an important component of bodily antioxidant systems. Known for its immune boosting properties, this mineral has many health benefits. Researchers have found zinc to be such a critical element in human health that even a small deficiency is a disaster. Zinc is so important because it is found in every tissue in the body and is directly involved in cell division. It is a powerful antioxidant, helping to prevent cancer, but zinc also is directly involved in proper endocrine function and the maintenance of ideal hormone levels. Zinc deficiency makes both men and women infertile and causes low libido. Low zinc also exacerbates the effects of stress on the body and accelerates aging. Additionally, adequate zinc is necessary for optimal physical performance, energy levels, and body composition. Zinc affects protein synthesis and is required for proper function of red and white blood cells. Other Ingredients: Cellulose, Magnesium Stearate (vegetable source), Silica and Vegetarian Coating. Vegetarian Formula.